Umesh Shkla, who impressed both critics and audiences with his movie OMG, is back with a new comedy drama. Sadly despite a great star cast of Abhishek Bachchan, Asin, Rishi Kapoor, Supriya Pathak, All Is Well does not meet the expectations that the audiences have from this director. The film which was released in theaters on 21st Aug 2015, has failed to make any mark so far. 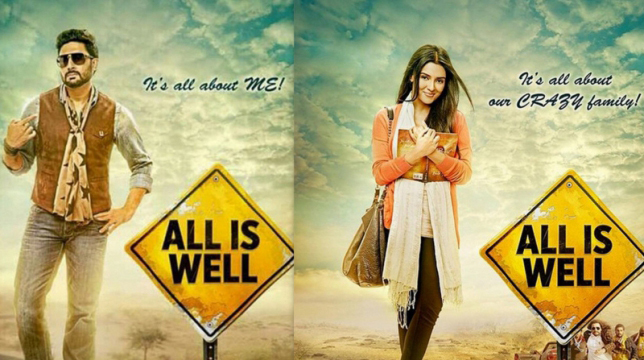 All Is Well tells the tale of Inder Bhalla played by Abhishek Bachchan who returns to his native hill town of Kasol, after spending a decade in Thailand. Back home, Inder’s father Bhajanlal Bhalla played by Rishi Kapoor seems to take pleasure in picking up on his wife Pammi played by Supriya Pathak and Inder. The young musician’s love life is also marred by trouble as his now once-on-now-off girlfriend Nimmi played by Asin seems to be indifferent towards him. Inder’s main reason for coming back is revealed to be the bumbling thug Cheema played by Zeeshan Mohammad Ayyub, who wants to grab the bakery of Bhajanlal in lieu of the huge loan he has lent to the elder Mr. Bhalla. The characters ensue on a cat and mouse chase changing vehicles, having pee breaks and lunches at dhabas on the Highways of Punjab and Himachal Pradesh, the audience is left wondering what the movie is all about. Despite the slapstick comedy and an almost non-existent storyline, the film does have some highlights in the form of performances of veteran actors Rishi Kapoor and Supriya Pathak. Even Abhishek and Asin have tried to do justice to the roles assigned to them even though their characters have been written so loosely and in a completely unconvincing manner. Overall, the movie is a complete failure should be watched only if you are an ardent fan of any of the main actors. IndiaCafe24 gives All Is Well a rating of 2 stars.